A patch of wild poppies has cropped up in our backyard and began blooming today! I hadn’t been entirely sure the greens weren’t weeds, so I was relieved to find this flower. These beauties are the California state flower, and they always remind me of a story Mama told me when I was little. When she was an elementary school teacher, she told her students that it was illegal to pick the poppies and there was an alarm system attached to the roots to catch vandals. 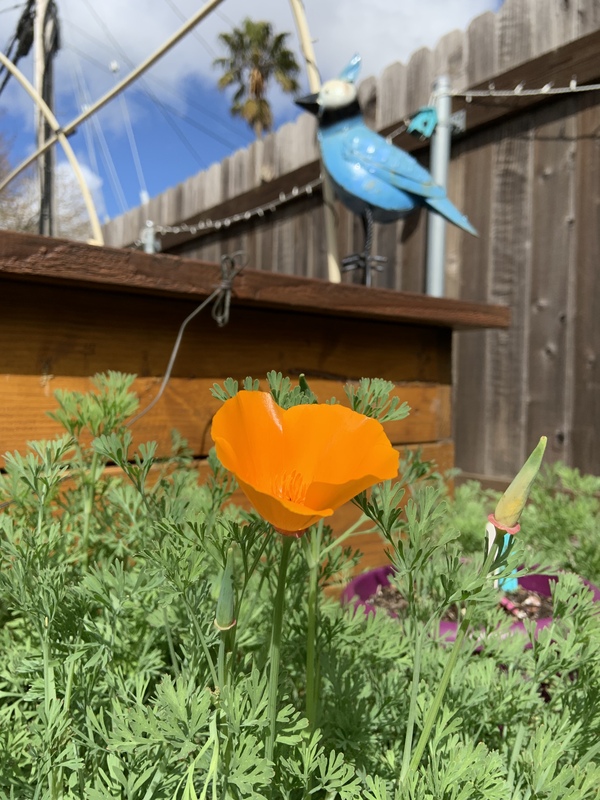 Today’s #OneGoodThing was the blooming of a wild poppy in our backyard! I won’t pick it. What was your #OneGoodThing today? Please share in the comments! Day 86 of 365. And Day 1,182 in a row (here’s the first 366, & the following 365, & the third year of 365 good things)! Jude’s students have probably never picked a poppy plant! They are my absolute favourite flower.